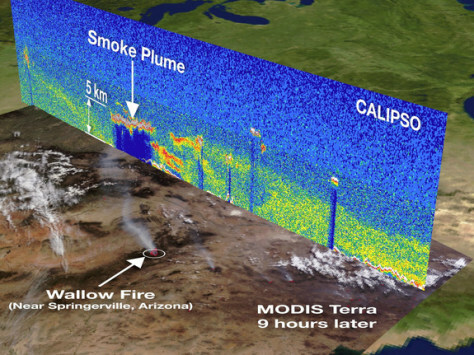 This image from NASA's CALIPSO satellite is a vertical profile from space that shows the June 3 smoke plume from the wildfires raging in Arizona. Here it is overlaid on an image captured by the Moderate Resolution Imaging Spectroradiometer instrument on the Terra satellite nine hours later. Calipso took its 3 billionth image on June 2.